SINGAPORE - Commuters using public transport will have another way to pay for their trips, with a digital scheme that also provides users with bus routes and timings. Launched by the Land Transport Authority (LTA) on Thursday (April 4), SimplyGo links a user's Mastercard credit or debit card to the transport providers. 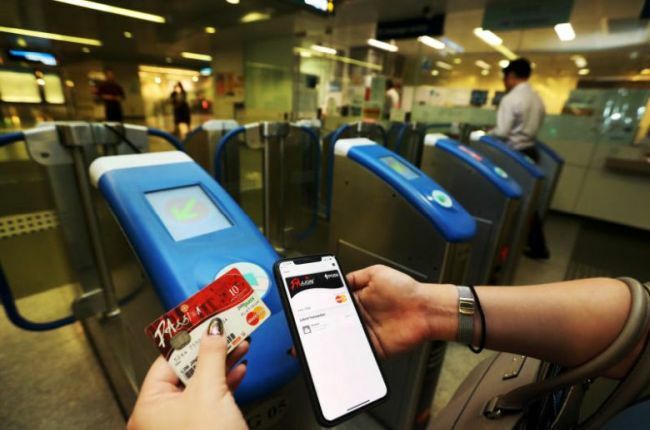 To use the service, commuters simply tap the ticketing machine with their Mastercard or mobile phone, which must already have Apple Pay, Fitbit Pay, Google Pay or Samsung Pay available. By downloading a SimplyGo application, users can also see the fare charged per trip and information such as bus routes and timings. They can also track their expenditure via the TransitLink SimplyGo portal. LTA said Visa is expected to come on board later this year. SimplyGo was launched at a roadshow at Downtown MRT station which Senior Parliamentary Secretary for Transport Baey Yam Keng attended. "Essentially, we want to make the experience of commuters as hassle-free and convenient as possible," he told reporters, noting that SimplyGo's introduction is in line with the Republic's Smart Nation and cashless goals. He said it is not replacing existing payment methods such as ez-link cards, but rather, providing commuters with a choice of payment modes. Senior Minister of State for Transport Janil Puthucheary first announced the scheme in Parliament last month following a two-year trial which began in 2017. Mastercard Singapore country manager Deborah Heng said the payments firm saw 26 million transactions from 100,000 users during the trial period, numbers it expects to rise with SimplyGo's official launch. She also noted that Mastercard has partnered other cities such as London and Kaoshiung to allow for its cards to be used to pay transit fares. Mr Nicholas Lim has used the service for his daily commutes here since the trial began. The 30-year-old, who works in the financial sector, said he enjoys the convenience of being able to pay using his phone and no longer has to worry about the balance amount in his travel cards. "I don't have to top up anymore, I just head to the gate," added Mr Lim. Mastercard users who are already using the built-in ez-link or Nets FlashPay function of their travel cards can switch payment modes at general ticketing machines if they wish to use SimplyGo. LTA said users should take their travel cards out of their wallets or bags to avoid duplicate fare charges or being denied entry at train stations. While there are no transaction fees for the service, concessions - such as those for senior citizens or students - are not available for those using SimplyGo, though LTA said they may be included in the future. Commuters are advised to sign up for an account at simplygo.transitlink.com.sg or through the SimplyGo mobile app to take advantage of features such as push notifications on their fares.